I have one looks great and works great. I have one also. Easy to install, and looks great. just bought it... I was going to build one this spring... but I am finally starting to figure out what my time is worth in life.... 2 hours of getting materials..... couple hours of measuring and contemplating... couple of hours of fab.... install time..... 125.00 well spent. I hope he makes more! I have had my eye on that and was hoping to get one next month. IMO, 4 inches is a shade too tall. I did a DIY 4 inch lift with aluminum and wish it was 1 inch shorter. I'm about 6' and my vision is right at the top of the windshield. I end up having to slouch. My 5'8" sister also thinks it's a shade high. 3" would be a better size. I started out with 2in and at 5'8 it was to short but it was easy and cheep just some 2in square tubing and a few holes. "The seat and original base not included as pictured. The black anodized seat base is the part for sale on auction. In picture 2 shows the factory seat base and the bolt on replacement. For a custom seat base orders send a message through ebay. this will fit most Malibu boats up to the year 2011. Make sure your seat base is the same as the one pictured. 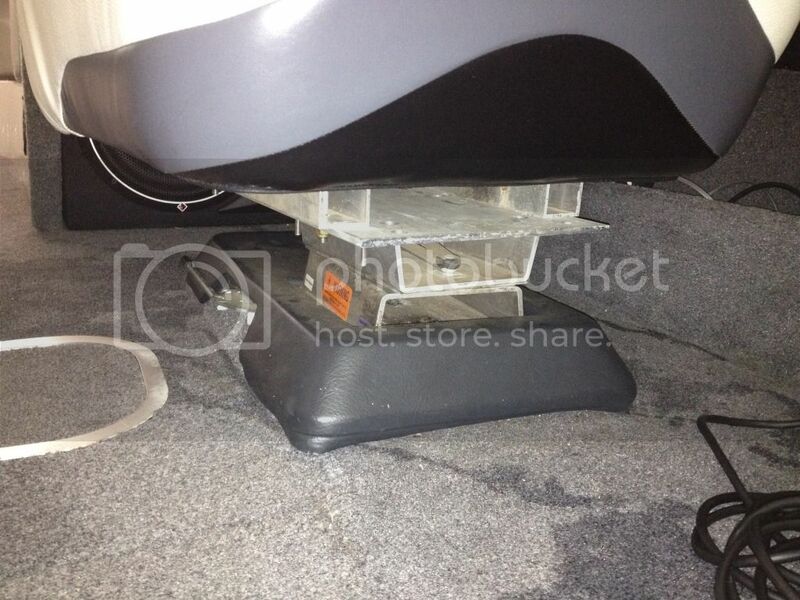 If you have a newer Malibu boat and would like a seat riser kit. Do you have a newer Malibu boat with the new seat configuration? The first one to message me and help me get the info I need to prototype it will get one free. Thanks for looking"
Yup, I've got a call in to him after an email - waiting for a call back. Just sent him measurements and a bunch of pictures, we'll see what he comes up with. Risers back for sale again on Ebay. I just ordered one... Been kicking around a DIY version for too long. Fid you ever get your protoype? If so, how did it work out? I'm tired of half standing/sitting.